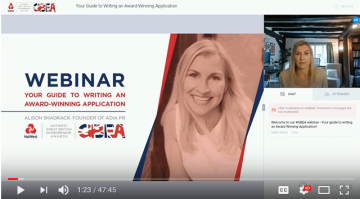 Alison was asked by The NatWest Great British Entrepreneur Awards team to run a webinar with them advising on how to write an award winning application. Awards are an important element in a PR strategy and over the past 4 years at Adia we've written a fair few for our clients. In the NatWest Great British Entrepreneur Awards alone, we've had 9 clients as finalists and 5 clients walking away with an award win! The NatWest Great British Entrepreneur Awards are now open and will close on 3rd August.